It went like this. I had just walked into the compound of my soon-to-be secondary school. As I walked in, taking in all the new sights and sounds, a person wearing a scout uniform walked up to me and handed me a flyer about the school's scout movement. I took it absentmindedly and thanked him. Little did I know that I would soon become an active member of that organization. After that I registered myself at a makeshift system set up by teachers and prefects. I signed my name on an attendance list and was told to wait inside a hall. The atmosphere in there was tense with anticipation. I could see tens of others just like me - waiting for what was to happen next. Rows of teachers sitting on plastic chairs lined the stage. There was a small podium at a corner of the stage and a few prefects were setting up the microphone stand. Eventually the headmistress went up to the podium and introduced herself. She then proceeded to introduce several important teachers in the schools. Next, she gave a long speech about the school's history, lasting about 10 minutes. After that, a few other teachers gave welcoming speeches and described their roles in the schools. We all found it quite interesting, if not a little bored by the end of it. Right after that, the teachers and prefects took us in a tour around the schools. We got to know the location of important places such as the library, public telephone, teachers' office, principal's office and most importantly, the toilet! Soon after, we were herded into our respective classes. Our class teacher, a kind-looking lady walked in and introduced herself. By now, the situation was still quite awkward so we had a few icebreakers. Tension dissolved, the teacher read out the timetable for each day. We scrambled to copy it down. Most of us didn't get the entire thing so we copied it from each other later on. We also got our textbooks soon after. As if on cue, the bell rang and we all went home. 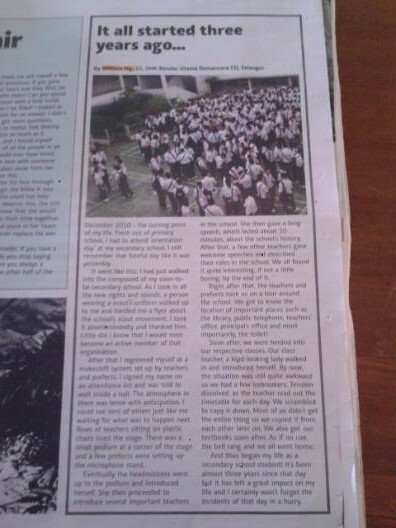 And thus began my life as a secondary school student! It's been almost 3 years since that day but it's left a great impact on my life and I certainly won't forget the incidents of that day in a hurry.